If ever there was a performance that epitomised Sheffield so aptly, so unashamedly and with such ease that you feel full to bursting with pride for your city, it has to be 'Songs from the Seven Hills'. Simultaneously weaving through six stories rooted firmly in the Steel City, audiences are carried far, wide and to perhaps more familiar places in the search for what it truly means to be ‘Made In Sheffield’. Whether in the bowels of an HGV motoring across borders in search of refuge from brutality, or vying for acceptance from your loved ones as you reveal your true identity, characters embark on journeys of growth, understanding, liberation, closure – and so much more than the eye can see. Ultimately, every character, whether native or otherwise, finds a home in Sheffield – it’s the place where they become whole. 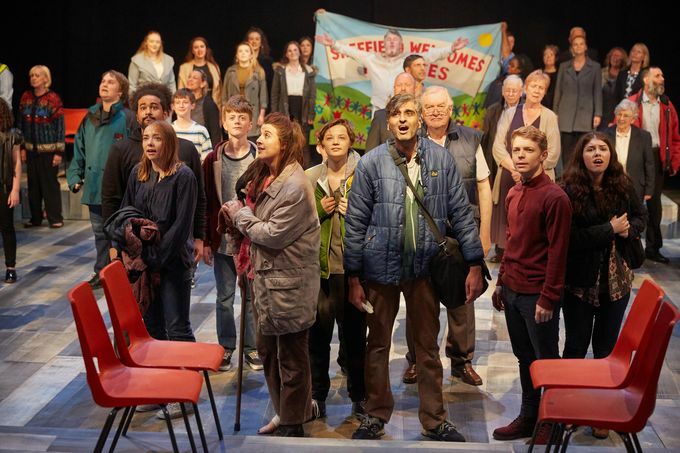 The Sheffield People’s Theatre’s diverse cast explores Sheffield in a way like no other, with warmth and resilience that is unique to the city. Utilising heartfelt harmonies paired with meaningful arrangements, the music from the seven hills has you rooting for the characters, and finding solace in the reality that Sheffield’s open arms have been able to resolve and empower so many. Zipping to and fro across the floor of the Crucible, the cast creates the London Underground, trains, new homes and shop displays simultaneously, impressing audiences with the stripped-back portrayals that are by no means scarce. As the seven hills remain, overarching every scene and encounter throughout, they serve as a constant reminder that Sheffield is ever-present, at the heart of everything, the backbone. Summed up, ‘Songs from the Seven Hills’ is a must-see, interweaving current and relatable issues (including the ever-sunny Skandea) with clever set design, devoted cast and passionate music. Sheffield was never depicted more accurately, more welcoming to its medley of inhabitants. ‘Songs from the Seven Hills’ is directed by Emily Hutchinson (What We Wished For), designed by Kevin Jenkins (A Dream) with musical direction from Matthew Malone (The Sheffield Mysteries). The musical will run in the Crucible until Saturday 21 July. Tickets start from £15 and are available now. They can be purchased from Sheffield Theatres’ box office in person, over the phone on 0114 249 6000, or online at www.sheffieldtheatres.co.uk.